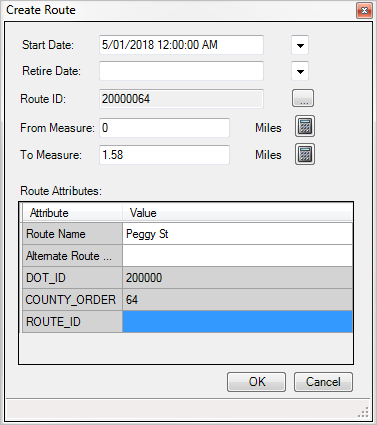 The redline feature class stores attributes, geographic location, and measure information for prospective route geometry changes. The purpose of the redline is to act as a markup feature for communicating linear referencing system (LRS) network changes to LRS editors. The redline can also serve as a temporary route feature so that LRS users who discover that data is missing from the LRS Network can continue to work without waiting for it to be updated. The redline feature class must be configured in the advanced linear referencing system (LRS) prior to editing LRS Networks. See LRS data model to learn more about the requirements for configuring the redline feature class. Redlines do not need to be m- or z-enabled to work with Esri Roads and Highways. The redline feature is accessed by clicking the Choose Redline tool on the Roads And Highways Editing toolbar. When a feature is selected using the Choose Redline tool, the activity dialog box is populated automatically with information from the redline feature. Start ArcMap and add an LRS Network and redline feature class to your map. Click the Networks drop-down arrow on the Roads And Highways Editing toolbar to choose an LRS Network to modify. Click the Choose Redline tool and click a redline feature on the map. The selected redline is highlighted with a bold, red line.